The introduction of Xero Projects came with great excitement as job costing was one of the most awaited features in Xero. In Xero’s feature request area, Job Costing is high up there at fifth place out of all requested features. If you want to use Xero Projects in your own business or recommend it to your clients there are six things you should know first. When you create an invoice from a project there is no link back from the invoice or any indication that it is related to a project. When you record an expense in a project it doesn’t create a bill or a spend money transaction in Xero. You can’t link existing invoices and bills to projects, or add expenses from Receipt Bank. Staff costs and timesheets also aren’t integrated. Xero support says the invoice and bank rec integration will be released next month. In the meantime, I would recommend Xero projects only to clients who need a simple method to record hours and invoice for them. Job costing in Xero is fantastic for those who have been waiting to move from MYOB AccountRight. Xero has gradually added payroll, quoting, purchase ordering, multiple email addresses on a contact, and of course, inventory. Job costing is traditionally seen as an essential component of an accounting system and was missing in Xero. Once Xero fixes up the bugs and integrations in Xero Projects it can tick off all the boxes in a comparison against MYOB AccountRight. Surprisingly, Xero did not implement job costing as an extra attribute on a transaction line. We all expected projects to be similar to tracking categories in Xero. Tracking categories is a value that you can assign to invoice lines, bill lines, bank transaction lines and journals. But Xero chose to implement Projects in a different way. 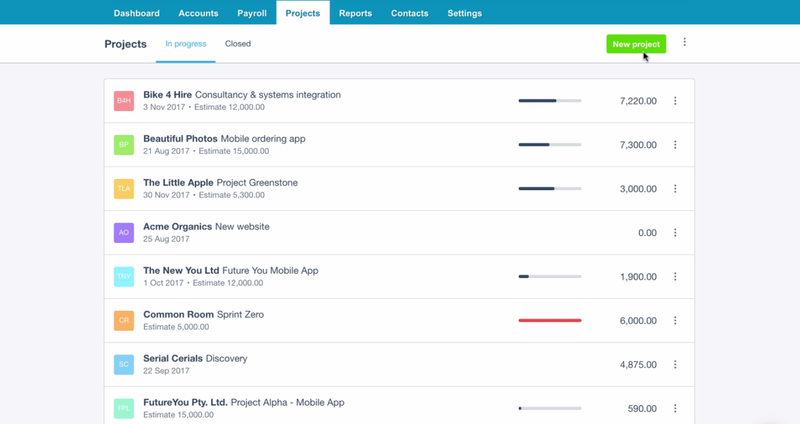 Xero Projects operates similarly to Workflow Max. The Projects module tracks time and expenses and a billing process generates invoices. It is possibly a more sophisticated method as you can add more complex project management features. But at these early stages it is hard to tell how far Xero will take this. Xero Projects will probably never become a full project management solution. That would require planning and scheduling, client collaboration, document management, and customisable alerts and notifications. We’ve learned that Xero like to focus on the accounting aspect of things, not necessarily the operational side of running your business. However, I am sure that as soon as the APIs are released, plenty of integrations to existing project management tools will become available. Xero Projects seems like a good solution for businesses that are not using anything except spreadsheets to track project profitability. These businesses will benefit hugely from having a single dashboard showing all projects, their progress, and never forgetting to invoice for a project. It lets them create a project, record time and expenses, and bill for time and material or by fixed price. Watertight project management prevents leakage, such as failing to charge supplier invoices to a client. It also includes bulk billing clients or attributing a supplier invoice to multiple jobs. If you need these then you will find Xero Projects somewhat frustrating. It is better to stay with Workflowmax or one of its equivalents. As a long time Xero user, and a long time WFM user, I’d agree with all of the above. Xero projects still has a way to go to be useful. The fact that the use of projects is essentially standalone, with no link back to other elements in Xero, makes it almost un-recommendable in its current format. I’m keenly sitting on the sidelines to see how it evolves and develops, but at this stage, I’d be struggling to recommend clients consider it as a viable option. Well, Cassandra, given that Xero are planning to charge for this feature, they are probably planning to invest significant effort in it. These days its a bit difficult to validate these statements when comparing to “MYOB” – there are multiple products in the MYOB family these days so I think it would be good to be more specific as to which MYOB product you are comparing Xero against. Thanks Richard, that’s a good point. Pretty sure Inbal was referring to AccountRight. Will confirm and update. With regards to ‘missing features in Xero’ to complete the functionality of MYOB, jobs seemed to be the last missing chunk of functionality. With regards to how projects were implemented in Xero, I was referring to how we all compare job tracking in MYOB with tracking categories in Xero (even the sponsored MYOB to Xero conversion from Jet Convert moves job information from MYOB into tracking categories in Xero). However the implementation of Projects in Xero seems to follow the WFM paradigm more than the MYOB AccountRight paradigm. Would you tend to agree? as a MYOB bookkeeper you really need to purchase one each.. and all the various updates..
XERO was for me THE platform because it doesnt matter which one the client uses, it is all accessible for free by me, the bookkeeper.. I also appreciate that the Xero program is always growing, improving etc, without for me the need to purchase another version of the same program ..
Lastly I am everytime amazed how intuitive the latest changes are..
MYOB needs to be taught in TAFE as a 6 month course.. It took me less then 2 hrs to be able to work with XERO. and any training is FOR FREE..
Again MYOB wanted me to pay for their courses and of course TAFE isnt free either. In short I am just showing that MYOB may or may not have certain added features..
Xero has indeed revolutionised how we collaborate around bookkeeping/accounting thanks to the benefits of cloud technology. It is interesting to see the new players coming in and offering competing solutions using the same technology. This includes new products from MYOB too. When you allocate tracked inventory items in Xero to Projects, the inventory quantity doesn’t update. There is 3x invoicing methods from projects, namely, Deposits, Time&Expense and Project Amount. The nice thing about invoicing with a project amount and deposit is that the invoice contains the Project Name (which is what a client is mostly interested in), and you can invoice per % or amount. But unless you invoice using the Time&Expenses invoice method, the tracked inventory will not update. Unfortunately that also means that the invoice has become very long with useless information. The client doesn’t want to know how many bolts etc I used for a machine… Just that the machine is done. Interesting point re the tracked inventory. Have you queried this with Xero support? It sounds like a bit of a glitch. Xero Projects is certainly still in its infancy. It would be very interesting to see whether Xero goes on investing in it to make it more usable, or keeps it to a minimum functionality, as they have done with inventory so far. Have you come up with some workaround for this?